The Swedish Journal of Sport Research is an open access journal publishing original articles on mainly pedagogical, psychological and sociological aspects of sport, but also educational, historical, and philosophical aspects. 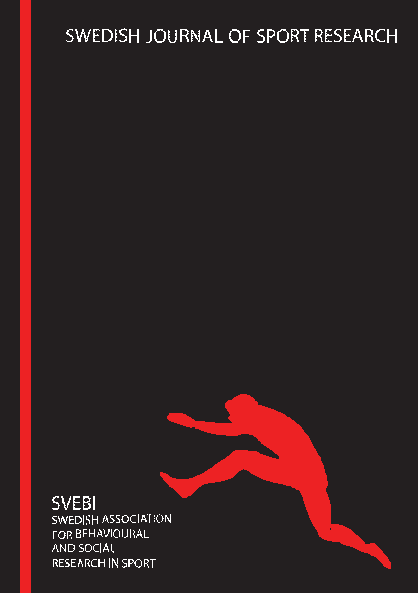 The Swedish Association for Behavioural and Social Research in Sport (SVEBI) invites researchers and doctoral candidates to contribute with original articles in The Swedish Journal of Sport Research (SJSR). All manuscripts are to be original contributions and may not simultaneously be sent to other scientific journals. The copyright for accepted articles passes over to SVEBI. Manuscripts can be submitted continuously, and will be published continuously on SVEBIs homepage if accepted. Manuscripts can be sent to the Editor Erwin.Apitzsch@psy.lu.se continuously. Confirmation of receipt will be sent. Individual manuscripts are de-identified and assessed by at least two independent reviewers (peer review), who give their opinions. It is on the basis of these assessments that the Editorial Committee then makes its decision. The manuscript may not exceed 6,000 words (excluding the abstract and references) which add up to approximately 18 pages in the journal. Please include a word count. Manuscripts exceeding 6,000 words will not be assessed. The manuscript is to be written in Times New Roman 14 with 1.5 line spacing. Manuscripts are accepted in English or in Swedish. If submitted in English, British-English spelling and punctuation is required. The authors are encouraged to have their papers language checked before they are submitted. Indicate which heading level is to be applied by writing the heading level number (1, 2 or 3) in brackets immediately after the heading. These numbers will not appear in the final text. Short quotations within the text are to be indicated by quotation marks. Do not use italics unless they are used in the original text. NB! Do not use straight quotation marks, but only typographical ones (“”). Long quotations, as well as quotations written in languages differing from that of the main text, are to be formatted with indentations and a smaller type size. The simplest way of writing this type of quotation is to use smaller type size. If, in addition, you wish to make indentations from the margin or use narrower line spacing that is fine. Quotation marks are not used for this type of quotation. Emphasis shall be shown by using italics. avoid hyphens in the middle of lines in the journal. Note that em dashes (long hyphens) are always to be used when one wishes to illustrate a pause. When dashes are used between numbers etc, there should be no space before or after the dash, for example: 2003–2007. References to sources are to be written in the text. The reference must state the surname of the author, the year and (in the case of quotations) the page reference. This is all in order to facilitate for the reader to quickly find the reference in question. A comma is used between the surname and the year and between the year and any page reference given. Page references are written with p. or pp. For example: Weinberg & Gould, 2014, p. 203. A semicolon is used between different references. For example: Weinberg & Gould, 2014; Chelladurai, 2007. Book titles that are mentioned in the ordinary text are to be written in italics and initial letters are to be capitalised in English titles. For example: Foundations of Sport & Exercise Psychology. The heading of the article must not be too long (max 100 characters). A short title, possibly with a subtitle, is the best. An abstract shall always be written and consist of a maximum of 1,000 characters, including blank spaces, and concluded with a maximum of 5 keywords. Any images/charts/tables are to be inserted in the right place in the document. Note that charts that are drawn up in A4 format will be scaled down! Please, note that the journal has no colour pages. Symbols, units and abbreviations in papers must confirm to the SI Units. For all abbreviations other than units, write the word or words to be abbreviated in full on the first mention, followed by the abbreviation in parentheses. When numeric values are given, a space must appear between the number and unit. Statistical definitions and symbols should conform to ISO3534-1977, summarised briefly in Council of Biology Editors (1994). Examples, P<0.05, r=0.71, s for standard deviations. Weinberg, R., & Gould, D. (2015). Foundations of Sport & Exercise Psychology 6th ed.). Champaign, IL: Human Kinetics. Chelladurai, P. (2007). Leadership in Sports. In G. Tenenbaum & R.C. Eklund (Eds)(2007). Handbook of Sport Psychology. Hoboken, NJ: John Wiley & Sons. Hare, R., Evans, L., & Callow, N. (2008). Imagery use during rehabilitation from injury; a case study of an elite athlete. The Sport Psychologist, 22, 405-422. Retrieved day, month, year e.g. 3 December, 2015, from [source]. Non-English references shall be translated into British-English, and are to be written in brackets after the original title. The whole manuscript is to be sent electronically to the Editor Erwin.Apitzsch@psy.lu.se. The cover page should include ALL the authors’ full names, affiliations, postal addresses, telephone numbers, and email addresses. The manuscript is to be provided with one blind title page excluding names. Please, include word count.